NCRA’s State Leadership Seminars Program now offers more topics for state association leaders to choose from when including a national presentation on their convention agendas. “The NCRA State Leadership Seminars program, which provides state association leaders the opportunity to request a presentation with special content for their membership, has been expanded to include a number of new topics that can be presented by an NCRA Board Member or staff expert,” said Matthew Barusch, NCRA’s State Government Relations Manager. The topics range from addressing professional practices to technology to schools and education and more. States can also opt to have a 60-minute Town Hall session presented by NCRA CEO and Executive Director Marcia Ferranto or an NCRA Board Member that provides valuable information on initiatives being driven at the national level to promote, protect, and grow the court reporting and captioning professions. “Through this enhanced program, state leaders now have more options regarding topics to help better inform and educate their members on issues important to the overall court reporting and captioning professions but also to aid in their own professional success,” Barusch said. Learn more about the newly expanded State Leadership Seminars or request a seminar. Requests need to be received by NCRA at least three months in advance of a scheduled event. 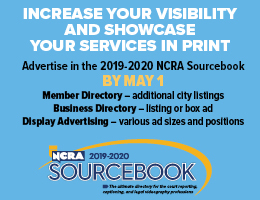 For questions, contact mbarusch@ncra.org. 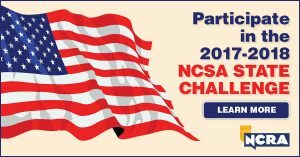 NCRA’s National Committee of State Associations (NCSA) has kicked off its fourth annual challenge among members and state associations to promote the court reporting and captioning professions to the public. The aim of the challenge is to encourage working professionals to reach out through career fairs and other activities to spread the word about what viable career paths court reporting and captioning are. The challenge will culminate during NCRA’s 2018 Court Reporting & Captioning Week, Feb. 10-17. NCSA will review and tally all submissions by members and state associations, and all entries will be eligible for prizes ranging from free webinars to event registrations. Bang suggests participants consider showcasing the profession by giving high school and career day demonstrations, participating in Veterans History Project events, hosting special events within the community, and more. “My motivating factor has been the threat of court reporting school closings. 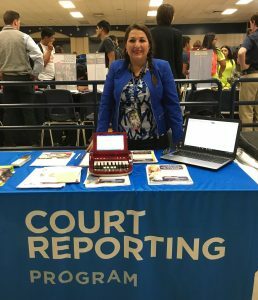 So many court reporting schools have been closing as of late,” said Erminia Uviedo, RDR, CRR, CRC, a freelance court reporter from San Antonio, Texas, and winner of the last two NCSA Challenges. To earn the top honors, Uviedo organized a team of volunteers to participate in dozens of high school career fairs throughout the state. Today, she continues her quest and reports that through these and other efforts (including media outreach), enrollment in area court reporting schools has started to rise. “San Antonio College had that threat a few years ago. We had 37 students enrolled at the time, and I made it my personal goal to see if we could attain 100 student enrollments. With 67 currently enrolled, we are well on our way,” she added. NCRA members and state associations can learn more about the NCSA Challenge by visiting NCRA.org/government. For the past three years, the National Committee of State Associations (NCSA) has issued a friendly challenge among state associations and individuals to spread the word about the benefits of a career in court reporting or captioning. Participants had the chance to win complimentary registrations to NCRA events or vouchers for continuing education. Erminia Uviedo, RDR, CRR, a freelance court reporter from San Antonio, Texas, has won the grand prize of a complimentary registration to the NCRA Convention & Expo for the last two challenges. In an interview about her first win, Uviedo said her goal was to win again in 2017 by beating her own record of coordinating participation in 26 school career fairs. And top honors she did earn by coordinating volunteers for participation in 32 career fairs and college nights in the San Antonio area. The JCR Weekly reached out to her to learn more about what motivates her to put so much effort into promoting the profession. How many career fairs did you organize for court reporters to participate in during this last NCSA challenge? I contacted, reserved tables, and coordinated volunteers for 32 career fair/college nights, mainly in San Antonio, but also reached out to some schools in South Texas, West Texas, and North Texas. How many of those did you participate in? I participated in seven events as a presenter. How did you identify events to participate? This year, I tried to add schools we didn’t reach last year, and we returned to the schools that had a good setup for meeting students. I also searched the Web for advertisements for college nights for certain areas. How did you recruit volunteers to help? What is the biggest factor motivating you to reach out to participate in so many career day events? My motivating factor has been the threat of court reporting school closings. So many court reporting schools have been closing as of late. San Antonio College had that threat a few years ago. We had 37 students enrolled at the time, and I made it my personal goal to see if we could attain 100 student enrollments. With 67 currently enrolled, we are well on our way. What have some of the responses been from students learning about court reporting for the first time? Students are always in awe of the technology. They are amazed. When I tell them it’s like texting, they are even more intrigued. Do you know of any students who have followed a career path in this profession because of career fairs you have participated in? Yes, I do, more than a couple. I always ask: Where did you hear about us? Some have said career fairs. Some have said Facebook posts. Some just knew somebody who knew somebody who was a court reporter. Do you serve as a mentor for current court reporting students? If so, why? Because court reporting is such a unique skill, students need motivation to keep going. Family members and friends don’t understand their frustration in getting a 95 percent on a test. But reporters definitely do. We can definitely relate. Sometimes all students need is a friendly ear. But working reporters also provide valuable information to students, likes tips on practicing, writing shorter, writing cleaner, dealing with test anxiety, and being professional. All of our San Antonio College court reporting students get sponsored to attend our state convention; every single one. Since our San Antonio Elite Mentorship Program got off the ground two years ago, we have so many more students advancing. The first year we had six sit for the certified shorthand reporter exam, more than we did in many years. This year we expect to have another five, at least. I am assuming you have fun participating in these events. What is the best part of participating for you? I love demonstrating realtime for students. I love to write what they are saying, and they get such a kick out of it. They are always fascinated, as are the teachers, counselors, and parents. What advice would you give to other reporters thinking of participating in career fairs? I would definitely tell them it’s a team effort. If they can get together a group of reporters who are all willing to cover these fairs in a certain area, that would be the best approach. Reporters’ schedules change daily, so, if a whole team is together and willing, the process of getting them all coordinated and covered will go that much smoother. What is the best part of attending a national convention? My first NCRA convention was in Las Vegas back in 2011. At the time, the best part for me was being kept apprised of all the issues facing our profession. I love advancing my skills. The first NCRA convention, I was excited about Realtime Coach. It was just starting. And I loved the concept because I was working on my realtime at the time. This past year, I was excited about attending the captioner’s workshop and learning about the field of captioning. What are you looking forward to most about this year’s convention? I loved meeting court reporting students and new reporters last year. I love to hear their stories of where they are working now, where they went to school, what they did to overcome obstacles, or how they practiced. Any tips I can bring back to our students. You were also a recipient of a JCR Award this year. Were you surprised? What is so important about earning this award? Yes, I was a little surprised. I feel so honored to have been recognized by NCRA. What an accomplishment! I feel it’s like winning an Emmy. What is your goal for next year’s NCSA challenge? I would love to reach more schools in the Rio Grande Valley, try to increase recruitment to 10 next year, as the Rio Grande Valley has been feeling the shortage for a while now and it’s such a wonderful place to live and work. I feel that every state needs to form a Student Recruitment Committee or Task Force. Map out your state and get to work! It’s not difficult at all. There are plenty of schools and recruiting opportunities. We just need the volunteers to cover them. We can keep our court reporting schools open! The National Committee of State Associations (NCSA) has issued a friendly challenge among state associations and individuals to spread the word about the benefits of a career in court reporting or captioning for the chance to win complimentary registrations to NCRA events or vouchers for continuing education. This is the third consecutive year NCSA has sponsored the challenge. The challenge calls on all state associations to join forces with their members to participate in career fairs, provide realtime demonstrations at high schools and guidance counselor meetings, participate in the Veterans History Project, and celebrate 2017 Court Reporting & Captioning Week being held Feb. 11-18. The competition, which officially launched Aug. 8, runs through Feb. 18, 2017. Anyone participating in a qualifying event during that time period can receive credit for it by documenting their efforts at the NCSA contest site. All entries will automatically be entered into the contest. There is no limit to the number of contest entries states can have. Click on the NSCA challenge registration site to register your event. “The spirit of Court Reporting & Captioning Week reflects the spirit and pride we have as members of this profession. It is never too soon or too late to share that spirit and pride with the members of our communities and to spread the word about the endless opportunities court reporting and captioning offer as a career path. I’m looking forward to learning about the many ways our members across the nation celebrate our wonderful profession,” said NCRA President Tiva Wood, RDR, CMRS, a freelance reporter from Mechanicsburg, Pa.
Bader encourages those interested in participating to visit the NCRA website for access to information and numerous suggestions about ways to showcase the court reporting and captioning professions. She also encourages those who are participating in the competition to share with other states their ideas about activities that have worked well in helping to promote the profession. 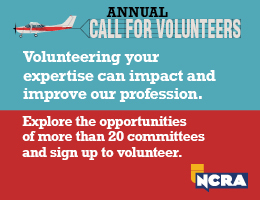 Those wanting to participate who might have additional questions can also contact their regional representative directly or reach out to state leaders at leaders@ncralists.ncra.org for more information. Participants are also encouraged to post pictures of presentations on their state association’s website and social media pages, as well as tweet using the hashtag #crTakeNote. In addition, please contact NCRA’s Assistant Director of Communications Annemarie Roketenetz at aroketenetz@ncra.org with information about activities for possible inclusion in the JCR Weekly. The prizes for the competition are tiered. Each entry into the raffle-type competition qualifies for the first, second, and third prizes. Each prize awarded is to be used at the state’s discretion, i.e. registrations for the president/delegate, raffle items/fundraising for future conventions, student gifts, etc. In addition, there is a grand prize for an individual reporter or captioner. First prize is five free NCRA webinars, while the grand prize is a complimentary registration to the 2017 NCRA Convention & Expo, being held in July in Las Vegas, Nev.
“This past year has been phenomenal, being a part of showcasing our profession, talking to so many students, and showing our millennials how to write at the speed of sound,” said Erminia Uviedo, RMR, CRR, a freelancer from San Antonio, Texas, and winner of last year’s NCSA challenge grand prize. “Seeing interested students, who are so amazed and fascinated by watching a court reporter or captioner writing realtime, brings such a rewarding and accomplished feeling as a court reporter. Our profession must continue to make appearances in schools because we must dispel the myth that the profession is obsolete and put it front and center in every way possible, especially with media coverage,” she added. Uviedo, who won last year’s challenge after participation in more than a dozen high school career fairs in just several weeks, noted that she is ready to break last year’s record. “Partner up with a friend. 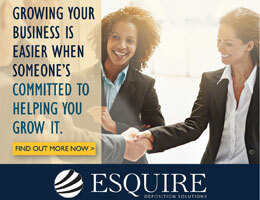 Get out there and promote our fabulous career. Challenge your friends to see who can complete the most demos, attend the most career fairs, and report the most Veterans History Project testimonials,” said Bader.